Lakbay Aral Espesyal! : Mi Casa, Su Casa. Gumaca! Mi Casa, Su Casa. 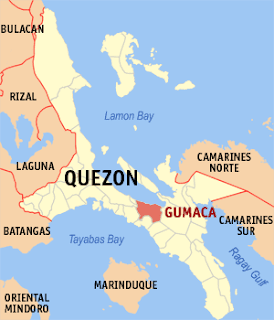 Gumaca! After a cup of coffee, a few pieces of pan de sal, and a few chats with my friends on Facebook, here I am writing my second entry with excitement and gusto. 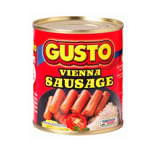 No, no, not really this type of gusto... But the dekada 90 babies do love this, don't you? For the main topic, ladies and gentlemen, and those in between, I'd like to introduce to you mi casa, Gumaca. 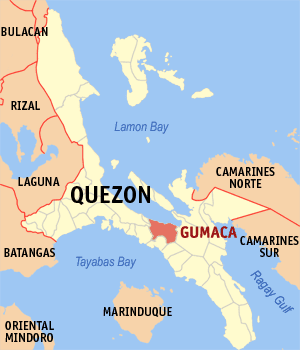 Gumaca is a coastal town situated at the heart of Quezon Province. Located 142.72 km from Manila, a 5-7 hour drive will take you to this agricultural town famous for it's centuries-old cathedral, fort, a festival bordering on the wild side, and a rather unusual delicacy called tikoy anahaw. Lifestyle is a bit on the laidback side, so if you just want to see the day go by while relaxing on a hammock, or on my favorite tumba-tumba, this is the place to be my friend. Not to worry for them yuppies, modern facilities and establishments dot the town, you won't even remember that you're miles away from Manila. One of the most loved town landmark (and personally my favorite) is the San Diego de Alcala Fortress. Locally known as kastilyo, just mention the name and see a Gumaqueño's face light up, wanting to take you there immediately. Sounds freaky, but this is the "it" place here! Kapitan, andyan na ang mga pirata mula sa kaharian ng DVD! Heck, this place is so loved, it's even in the municipal seal! Yep, a fortcentric town. Di magigiba! Since this is located along Lamon Bay, there's also a paved boulevard where you can stroll and see the sun go down. Or have a drink or two. Or take your special someone with you to take a walk, HHWW, PSSP (holding hands while walking, pa-sway-sway pa for those who don't know what I just typed!) This is Gumaca's answer to Manila's Baywalk. 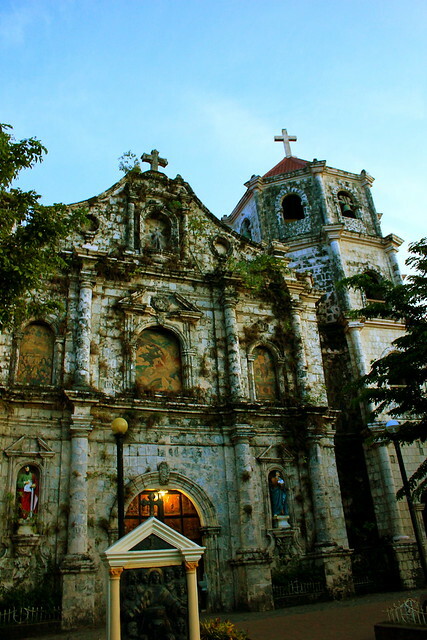 Another must-see attraction is the centuries-old San Diego de Alcala Cathedral. Built by the Franciscans, this baroque church is actually 265 years old! Come May 15, a riotous display of Gumaqueno's ingenuity and devotion for San Isidro Labrador is the Araña't Baluarte Festival. The name means chandelier (araña) and bastion or fort (baluarte). Local produce are arranged in arañas and baluartes to create this beautiful tapestry showing how creative and resourceful Gumaqueños and Filipinos are. Hanging Gardens of Babylon? Nope, it's Araña't Baluarte Festival! Bitin? I'll post more details on these attraction soon, but for now, Imma enjoy this Chicharron ni Mang Juan Espesyal na Suka't Sili before taking my lunch of daing na bangus.